A man was shot near the Uptown branch of the Chicago Public Library Monday morning. UPTOWN — For weeks, Kelsey Greene saw a police car parked in the library parking lot when she peeked out her apartment window in the morning. But when she looked Monday morning after hearing a gunshot, the cruiser was absent and she saw a much more horrific site. "I looked out my window and saw a man shooting another man right outside a library," said Greene, 24. "At 10 a.m., across from the library ... [it] was all very odd." After looking out the window, Greene saw three men running down Buena Avenue followed by three more gunshots. The man would fall down just in front of 7-Eleven at 4150 N. Broadway and police would arrive about 10 minutes later, she said. "I was shaking. I was concerned, but once police came I was much more assured," she said. From her window, she would watch police wrap her car and the rest of the block in red and yellow police tape. Minutes later, concerned residents would gather outside the tape trying to piece together what happened, she said. 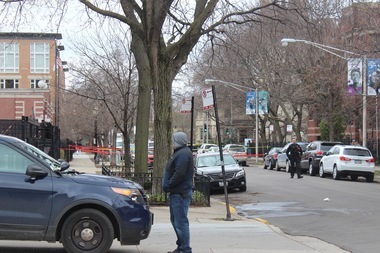 Around 10:20 a.m. Monday, a 22-year-old man was shot after two men walked up to him and opened fire near the Uptown Branch of the Chicago Public Library in the 900 block of West Buena Avenue, police said. The man was shot in his chest and taken to Illinois Masonic Medical Center in critical condition, said Officer Janel Sedevic, a Chicago Police spokeswoman. Despite the police presence in the lot before to the incident, police had "no intelligence that would tell us this would happen," said Sgt. Jason Clark, at Thursday's Beat 1913 CAPS meeting for the Town Hall District. The district includes Lakeview and parts of Uptown, Lincoln Square, North Center and Lincoln Park. The victim of Monday's shooting was visiting a friend before he was shot, but police have not been able to get more information from him because he's still in the hospital, Clark said..
"For us, it is unusual especially that early in the morning," Clark said, adding shootings usually occur in the area between 5-7 p.m.
Just four months into the year, shootings in the Town Hall District have reached double figures, almost reaching the total for all of last year. Three people have been killed and 10 people wounded, including the man shot Monday morning, in shootings in the district this year. In 2015, four people were killed and 10 people were wounded in shootings, according to data from DNAinfo. After watching the street transition from a crime scene to a route for dog walkers and families on their way home hours later, Greene attended the meeting "to just understand the issue of gun/gang violence at deeper level," she said. "It's been crazy. It's just an accepted state" in Chicago, said the 24-year-old, who moved to the neighborhood about a year ago. Ahead of the meeting at The Shift, 4101 N. Broadway, Ald. James Cappleman (46th) encouraged neighbors to attend "to be a part of the discussion surrounding the incident and overall safety in our neighborhood." Last week, Cappleman announced the Town Hall District has added 26 additional officers over the past six months, though the force hasn't grown as quickly as promised. Cappleman and Ald. Tom Tunney (44th) said they secured a promise for more officers in exchange for their votes for a $589 million property tax hike in October. The force will grow by an additional 10 officers on Sunday, and Cappleman said adding he's talked to the district about adding foot patrols near problem areas in the neighborhood. This year, Ald. Harry Osterman has ramped up police patrols along Argyle Street ahead of the completion of the Argyle Streetscape. The foot patrols are similar to tactics police are using to reduce crime in troubled neighborhoods across the country in lieu of tactics like stop-and-frisk, which has been criticized as unfairly targeting minorities and low-income residents.